The parts manager is in development. All required functionality is not implemented. Additionally, GParts requires a database for the back-end. 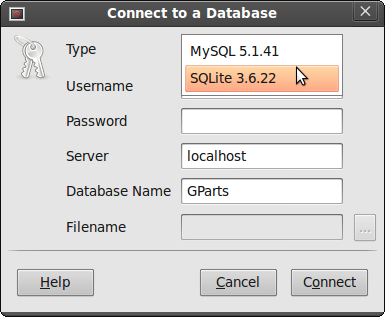 Currently, GParts can use either MySQL, PostgreSQL, or SQLite. In order to use MySQL, the packages listed below must be installed. The mysql-server package may not be required if configured to use a remote server. Of course, installing all packages before building allows the application to use either database for the back-end. If needed, obtain the source from the source repository. remote: Counting objects: 930, done. remote: Compressing objects: 100% (712/712), done. Receiving objects: 100% (930/930), 745.34 KiB | 283 KiB/s, done. Resolving deltas: 100% (735/735), done. In the top directory of the source package, execute the following commands. Support for PostgreSQL is incomplete, so use the configure option. The install requires root privileges. To ensure dynamically loaded modules for database support work, select Database→Connect… from the part manager menu. The combo box Database Type should so options for the various databases supported. If no database modules appear in the combo box, it is likely the parts manager could not find the rc files. The parts manager needs to know the location of system-gafrc file. The parts manager will search for this file, but sometimes cannot locate it. Providing the following environment variable provides better results. For distributions using Debian packages, the system-gafrc file can be located with dpkg. Additionally, the parts manager needs to know the location of the symbol library and scheme files. To create the database, enter MySQL command line mode as root and enter the SQL commands below. Placing the password in the command line could leave the password in the command line history. Using only the -p option will cause mysql to prompt for the password and avoid this situation. A different database name, other than gparts, can be specified by the user. Using different names, the user can create multiple GPart databases. Additionally, user accounts may need to be created. After creating the database, the base tables and part-specific tables must be created. All the SQL commands to perform these operations are included in the distributed files. Enter the following commands at the MySQL command line. Begin loading the database, starting with package data. The package data must be loaded before any parts. The package includes a tool to parse the symbol libraries and generate an SQL file for import into the database. Run the tool at the shell prompt, then import the file from an MySQL prompt. The tool requires the root gEDA directory as the only parameter. Your gEDA root directory may be different than below. The symbol data must be loaded before any parts. The package includes a script to generate some sample part data. Similar to the symbol tool, run the script at the shell prompt, then import the data at the MySQL prompt. The source package contains a sample database in the location below. This database can be opened from directly within the parts manager. If required, use the following command line to create a new database or recreate the sample database. In this example, the present working directory must be gparts/sql/sqlite. After creating the database, read base and part specific tables into the database. Read sample symbols into the database. Exit the command line interface. Read sample companies and packages into the database. The source distribution stores packages in XML. The distribution contains an XSLT stylesheet to convert XML into SQL for importing into SQLite. Use the following command line to perform this operation. Read sample parts into the database. For other sample parts, the data is not generated with a script.